St. Augustine, one of the four great fathers of the Latin Church. Augustinus -- the praenomen Aurelius is used indeed by his disciples Orosius and Prosper, and is found in the oldest Augustine manuscripts, but is not used by himself, nor in the letters addressed to him -- was born at Tagaste, a town of Numidia, now Souk-Ahras in Algeria, on the 13th of November 354. His father, Patricius, was a burgess of Tagaste and still a pagan at the time of his son's birth. His mother, Monica, was not only a Christian, but a woman of the most tender and devoted piety, whose beautiful faith and enthusiasm and patient prayer for both her husband and son (at length crowned with success in both cases) have made her a type of womanly saintliness for all ages. She early instructed her son in the faith and love of Jesus Christ, and for a time he seems to have been impressed by her teaching. Falling ill, he wished to be baptized; but when the danger was past, the rite was deferred and, in spite of his mother's ad-monitions and prayers, Augustine grew up without any profession of Christian piety or any devotion to Christian principles. Inheriting from his father a passionate nature, he formed while still a mere youth an irregular union with a girl, by whom he became the father of a son, whom in a fit of pious emotion he named Adeodatus ("by God given"), and to whom he was passionately attached. In his Confessions he afterwards described this period of his life in the blackest colors; for in the light of his conversion he saw behind him only shadows. Yet, whatever his youthful aberrations, Augustine was from the first an earnest student. His father, noticing his early promise, destined him for the brilliant and lucrative career of a rhetorician, for which he spared no expense in training him. Augustine studied at his native town and afterwards at Madaura and Carthage, especially devoting himself to the works of the Latin poets, many traces of his love for which are to be found in his writings. His acquaintance with Greek literature was much more limited, and, indeed, it has been doubted, though without sufficient reason, whether he could use the Greek scriptures in the original. Cicero's Hortensius, which he read in his nineteenth year, first awakened in his mind the spirit of speculation and the impulse towards the knowledge of the truth. But he passed from one phase of thought to another, unable to find satisfaction in any. Manichaeism, that mixed product of Zoroastrian and Christian-gnostic elements, first enthralled him. He became a fervent member of the sect, and was admitted into the class of auditors or "hearers." Manichaeism seemed to him to solve the mysteries of the world, and of his own experiences by which he was perplexed. His insatiable imagination drew congenial food from the fanciful religious world of the Manichaeans, decked out as this was with the luxuriant wealth of Oriental myth. His strongly developed sense of a need of salvation sought satisfaction in the contest of the two principles of Good and Evil, and found peace, at least for the moment, in the conviction that the portions of light present in him would be freed from the darkness in which they were immersed. The ideal of chastity and self-restraint, which promised a foretaste of union with God, amazed him, bound as he was in the fetters of sensuality and for ever shaking at these fetters. But while his moral force was not sufficient for the attainment of this ideal, gradually everything else which Manichaeism seemed to offer him dissolved before his criticism. Increasingly occupied with the exact sciences, he learned the incompatibility of the Manichaean astrology with the facts. More and more absorbed in the problems of psychology, he realized the insufficiency of dualism, which did not solve the ultimate questions but merely set them back. The Manichaean propaganda seemed to him invertebrate and lacking in force, and a discussion which he had with Faustus, a distinguished Manichaean bishop and controversialist, left him greatly disappointed. Meanwhile nine years had passed. Augustine, after finishing his studies, had returned to Tagaste, where he became a teacher of grammar. He must have been an excellent master, who knew how to influence the whole personality of his pupils. It was then that Alypius, who in the later stages of Augustine's life proved a true friend and companion, attached himself to him. He remained in his native town little more than a year, during which time he lived with his mother, who was comforted by the bishop for the estrangement of her son from the Catholic faith ("a son of so many tears cannot be lost": Confess. III. xii. 21), comforted also, and above all, by the famous vision, which Augustine thus describes: "She saw herself standing on a certain wooden rule, and a shining youth coming towards her, cheerful and smiling upon her the while she grieved, and was consumed with grief: and when he had inquired of her the causes of her grief and daily tears (for the sake, as is their wont, of teaching, not of learning) and she had made answer that she was bewailing my perdition, he bade her be at ease, and advised her to look and observe, 'That where she was, there was I also.' And when she looked there, she saw me standing by her on the same rule" (Confess. III. xi.). Augustine now returned for a second time to Carthage, where he devoted himself zealously to work. From there, probably in the spring of 383, he migrated to Rome. His Manichaean friends urged him to take this step, which was rendered easier by the licentious lives of the students at Carthage. His stay at Rome may have lasted about a year, no agreeable time for Augustine, since his patrons and friends belonged to just those Manichaean circles with which he had in the meantime entirely lost all intellectual touch. He, therefore, accepted an invitation from Milan, where the people were in search of a teacher of rhetoric. At Milan the conflict within his mind in search of truth still continued. It was now that he separated himself openly from the Manichaean sect. As a thinker he came entirely under the influence of the New Academy; he professed the Skeptic philosophy, without being able to find in it the final conclusion of wisdom. He was, however, not far from the decision. Two things determined his further development. He became acquainted with the Neo-Platonic philosophy; its monism replaced the dualism, its intellectualized world of ideas the materialism of Manichaeism. Here he found the admonition to seek for truth outside the material world, and from created things he learned to recognize the invisible God; he attained the certainty that this God is, and is eternal, always the same, subject to change neither in his parts nor in his motions. And while thus Augustine's metaphysical convictions were being slowly remodelled, he met, in Ambrose, bishop of Milan, a man in whom complete worldly culture and the nobility of a ripe Christian personality were wonderfully united. He heard him preach; but at first it was the orator and not the contents of the sermons that enchained him. He sought an opportunity of conversation with him, but this was not easily found. Ambrose had no leisure for philosophic discussion. He was accessible to all who sought him, but never for a moment free from study or the cares of duty. Augustine, as he himself tells us, used to enter without being announced, as all persons might; but after staying for a while, afraid of interrupting him, he would depart again. He continued, however, to hear Ambrose preach, and gradually the gospel of divine truth and grace was received into his heart. He was busy with his friend Alypius in studying the Pauline epistles; certain words were driven home with irresistible force to his conscience. His struggle of mind became more and more intolerable, the thought of divine purity fighting in his heart with the love of the world and the flesh. That sensuality was his worst enemy he had long known. The mother of his child had accompanied him to Milan. When he became betrothed he dismissed her; but neither the pain of this parting nor consideration for his not yet marriageable bride prevented him from forming a fresh connection of the same kind. Meanwhile, the determination to renounce the old life with its pleasures of sense, was ever being forced upon him with more and more distinctness. He then received a visit from a Christian compatriot named Pontitian, who told him about St. Anthony and the monachism in Egypt, and also of a monastery near Milan. He was shaken to the depths when he learned from Pontitian that two young officials, like himself betrothed, had suddenly formed a determination to turn their backs upon the life of the world. He could no longer bear to be inside the house; in terrible excitement he rushed into the garden; and now followed that scene which he himself in the Confessions has described to us with such graphic realism. He flung himself under a fig tree, burst into a passion of weeping, and poured out his heart to God. Suddenly he seemed to hear a voice bidding him consult the divine oracle: "Take up and read, take up and read." He left off weeping, rose up, sought the volume where Alypius was sitting, and opening it read in silence the following passage from the Epistle to the Romans (13:13-14): "Not in rioting and drunkenness, not in chambering and wantonness, not in strife and envying. But put ye on the Lord Jesus Christ, and make not provision for the flesh to fulfil the lusts thereof." He adds: "I had neither desire nor need to read further. As I finished the sentence, as though the light of peace had been poured into the heart, all the shadows of doubt dispersed. Thus hast Thou converted me to Thee, so as no longer to seek either for wife or other hope of the world, standing fast in that rule of faith in which Thou so many years before hadst revealed me to my mother" (Confess. VIII. xii. 30). The conversion of Augustine, as we have been accustomed to call this event, took place in the late summer of 386, a few weeks before the beginning of the vacation. The determination to give up his post was rendered easier by a chest trouble which was not without danger, and which for months made him incapable of work. He withdrew with several companions to the country estate of Cassisiacum near Milan, which had been lent him by a friend, and announced himself to the bishop as a candidate for baptism. His religious opinions were still to some extent unformed, and even his habits by no means altogether such as his great change demanded. He mentions, for example, that during this time he broke himself of a habit of profane swearing, and in other ways sought to discipline his character and conduct for the reception of the sacred rite. He received baptism the Easter following, in his thirty-third year, and along with him his son Adeodatus and his friend Alypius were admitted to the Church. Monica, his mother, had rejoined him, and at length rejoiced in the fulfilment of her prayers. She died at Ostia, just as they were about to embark for Africa, her last hours being gladdened by his Christian sympathy. In the account of the conversation which he had with his mother before her end, in the narrative of her death and burial (Confess. IX. x-xi, 23-28), Augustine's literary power is displayed at its highest. The plan of returning home remained for the present unaccomplished. Augustine stayed for a year in Rome, occupied in literary work, particularly in controversy with Manichaeism. It was not until the autumn of 388 that he returned to Tagaste, probably still accompanied by his son, who, however, must have died shortly afterwards. With some friends, who joined him in devotion, he formed a small religious community, which looked to him as its head. Their mode of life was not formally monastic according to any special rule, but the experience of this time of seclusion was, no doubt, the basis of that monastic system which Augustine afterwards sketched and which derived its name from him. As may be imagined, the fame of such a convert in such a position soon spread, and invitations to a more active ecclesiastical life came to him from many quarters. He shrank from the responsibility, but his destiny was not to be avoided. After two and a half years spent in retirement he went to Hippo, to see a Christian friend, who desired to converse with him as to his design of quitting the world and devoting himself to a religious life. The Christian community there being in want of a presbyter and Augustine being present at the meeting, the people unanimously chose him and he was ordained to the presbyterate. A few years afterwards, 395 or 396, he was made coadjutor to the bishop, and finally became bishop of the see. Henceforth Augustine's life is filled up with his ecclesiastical labors, and is more marked by the series of his numerous writings and the great controversies in which they engaged him than by anything else. His life was spent in a perpetual strife. During the first half this had been against himself; but even when others stepped into his place, it always seems as though a part of Augustine himself were incarnate in them. Augustine had early distinguished himself as an author. He had written several philosophical treatises, and, as teacher of rhetoric at Carthage, he had composed a work De pulchro et apto, which is no longer extant. When at Cassisiacum he had combated the skepticism of the New Academy (Contra Academicos), had treated of the "blessed life" (De Vita beata), of the significance of evil in the order of the world (De ordine), of the means for the elucidation of spiritual truths (Soliloquia). Shortly before the time of his baptism, he was occupied with the question of the immortality of the soul (De immortalitate animae), and in Rome and at Tagaste he was still engaged with philosophical problems, as is evidenced by the writings De quantitate animae and De magistro. In all these treatises is apparent the influence of the Neo-Platonic method of thought, which for him, as for so many others, had become the bridge to the Christian. While still in Rome, he began to come to a reckoning with the Manichaeans, and wrote two books on the morals of the Catholic Church and of the Manichaeaps (De moribus ecclesiae Catholicae et de moribus Manichaeorum libri duo). For many years he pursued this controversy in a long series of writings, of which the most conspicuous is the elaborate reply to his old associate and disputant, Faustus of Mileve (Contra Faustum Manichaeum, AD 400). It was natural that the Manichaean heresy, which had so long enslaved his own mind, should have first exercised Augustine's great powers as a theological thinker and controversialist. He was able from his own experience to give force to his arguments for the unity of creation and of the spiritual life, and to strengthen the mind of the Christian Church in its last struggle with that dualistic spirit which had animated and moulded in succession so many forms of thought at variance with Christianity. But the time was one of almost universal ecclesiastical and intellectual excitement; and so powerful a mental activity as his was naturally drawn forth in all directions. Following his writings against the Manichaeans came those against the Donatists. The controversy was one which strongly interested him, involving as it did the whole question of the constitution of the Church and the idea of catholic order, to which the circumstances of the age gave special prominence. The Donatist controversy sprang out of the Diocletian persecution in the beginning of the century. A party in the Church of Carthage, fired with fanatic zeal on behalf of those who had courted martyrdom by resistance to the imperial mandates, resented deeply the appointment of a bishop of moderate opinions, whose consecration had been performed, they alleged, by a traditor, viz. 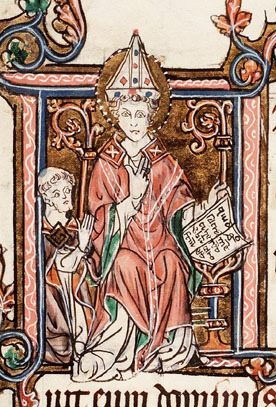 a bishop who had "delivered" the holy scriptures to the magistrates. They set up, in consequence, a bishop of their own, of the name of Majorinus, succeeded in 315 by Donatus. The party made great pretensions to purity of discipline, and rapidly rose in popular favor, notwithstanding a decision given against them both by the bishop of Rome and by the emperor Constantine. Augustine was strongly moved by the lawlessness of the party and launched forth a series of writings against them, the most important of which survive. Amongst these are "Seven Books on Baptism" (De baptismo contra Donatistas, c. AD 400) and a lengthy answer, in three books, to Petilian, bishop of Cirta, who was the most eminent theologian amongst the Donatist divines. At a later period, about 417, Augustine wrote a treatise concerning the correction of the Donatists (De correctione Donatistarum) "for the sake of those", he says in his Retractations, "who were not willing that the Donatists should be subjected to the correction of the imperial laws." In these writings, while vigorously maintaining the validity of the Church as it then stood in the Roman world, and the necessity for moderation in the exercise of church discipline, Augustine yet gave currency, in his zeal against the Donatists, to certain maxims as to the duty of the civil power to control schism, which were of evil omen, and have been productive of much disaster in the history of Christianity. The third controversy in which Augustine engaged was the most important, and the most intimately associated with his distinctive greatness as a theologian. As may be supposed, owing to the conflicts through which he had passed, the bishop of Hippo was intensely interested in what may be called the anthropological aspect of the great Christian idea of redemption. He had himself been brought out of darkness into "marvellous light", only by entering into the depths of his own soul, and finding, after many struggles, that there was no power but divine grace, as revealed in the life and death of the Son of God, which could bring rest to human weariness, or pardon and peace for human guilt. He had found human nature in his own case too weak and sinful to find any good for itself. In God alone he had found good. This deep sense of human sinfulness colored all his theology, and gave to it at once its depth -- its profound and sympathetic adaptation to all who feel the reality of sin -- and that tinge of darkness and exaggeration wtich has as surely repelled others. When the expression "Augustinism" is used, it points especially to those opinions of the great teacher which were evoked in the Pelagian controversy, to which he devoted the most mature and powerful period of his life. His opponents in this controversy were Pelagius, from whom it derives its name, and Coelestius and Julianus, pupils of the former. Nothing is certainly known as to the home of Pelagius. Augustine calls him "Brito", and so do Marius Mercator and Orosius; St. Jerome points to his Scottish descent, in such terms, however, as to leave it uncertain whether he was a native of Scotland or of Ireland. He was a man of blameless character, devoted to the reformation of society, full of that confidence in the natural impulses of humanity which often accompanies philanthropic enthusiasm. About the year 400 he came, no longer a young man, to Rome, where he lived for more than a decade, and soon made himself conspicuous by his activity and by his opinions. His pupil Coelestius, a lawyer of unknown origin, developed the views of his master with a more outspoken logic, and, while travelling with Pelagius in Africa, in the year 411, was at length arraigned before the bishop of Carthage for the following, amongst other heretical opinions: (1) that Adam's sin was purely personal, and affected none but himself; (2) that each man, consequently, is born with powers as incorrupt as those of Adam, and only falls into sin under the force of temptation and evil example; (3) that children who die in infancy, being untainted by sin, are saved without baptism. Views such as these were obviously in conflict with the whole course of Augustine's experience, as well as with his interpretation of the catholic doctrine of the Church. And when his attention was drawn to them by the trial and excommunication of Coelestius, he undertook their refutation, first of all in three books on the punishment and forgiveness of sins and the baptism of infants (De peccatorum meritis et remissione et de baptismo parvulorum), addressed to his friend Marcellinus, in which he vindicated the necessity of baptism of infants because of original sin and the grace of God by which we are justified (Retract. ii. 23). This was in 412. In the same year he addressed a further treatise to the same Marcellinus on The Spirit and the Letter (De spiritu et littera). Three years later he composed the treatises on Nature and Grace (De natura et gratia) and the relation of the human to the divine righteousness (De perfectione iustitiae hominis). The controversy was continued during many years in no fewer than fifteen treatises. Upon no subject did Augustine bestow more of his intellectual strength, and in relation to no other have his views so deeply and permanently affected the course of Christian thought. Even those who most usually agree with his theological standpoint will hardly deny that, while he did much in these writings to vindicate divine truth and to expound the true relations of the divine and human, he also, here as elsewhere, was hurried into extreme expressions as to the absoluteness of divine grace and the extent of human corruption. Like his great disciple in a later age -- Martin Luther -- Augustine was prone to emphasize the side of truth which he had most realized in his own experience, and, in contradistinction to the Pelagian exaltation of human nature, to depreciate its capabilities beyond measure. In addition to these controversial writings, which mark the great epochs of Augustine's life and ecclesiastical activity after his settlement as a bishop at Hippo, he was the author of other works, some of them better known and even more important. His great work, the most elaborate, and in some respects the most significant, that came from his pen, is The City of God (De civitate Dei). It is designed as a great apologetic treatise in vindication of Christianity and the Christian Church -- the latter conceived as rising in the form of a new civic order on the crumbling ruins of the Roman empire -- but it is also, perhaps, the earliest contribution to the philosophy of history, as it is a repertory throughout of his cherished theological opinions. This work and his Confessions are those by which he is best known, the one as the highest expression of his thought, and the other as the best monument of his living piety and Christian experience. The City of God was begun in 413, and continued to be issued in its several portions for a period of thirteen years, or until 426. The Confessions were written shortly after he became a bishop, about 397, and give a vivid sketch of his early career. To the devout utterances and aspirations of a great soul they add the charm of personal disclosure, and have never ceased to excite admiration in all spirits of kindred piety. Something of this charm also belongs to the Retractations, that remarkable work in which Augustine, in 427, towards the end of his life, held as it were a review of his literary activity, in order to improve what was erroneous and to make clear what was doubtful in it. His systematic treatise on The Trinity (De Trinitate) which extends to fifteen books and occupied him for nearly thirty years, must not be passed over. This important work, unlike most of his dogmatic writings, was not provoked by any special controversial emergency, but grew up silently during this long period in the author's mind. This has given it something more of completeness and organic arrangement than is usual with Augustine, if it has also led him into the prolonged discussion of various analogies, more curious than apt in their bearing on the doctrine which he expounds. Brief and concise is the presentation of the Catholic doctrine in the compendium, which, about 421, he wrote at the request of a Roman layman named Laurentius (Encheiridion, sive de fide spe et caritate). In spite of its title, the compendious work on Christian doctrine (De doctrina christiana), begun as early as 393, but only finished in 426, does not belong to the dogmatic writings. It is a sort of Biblical hermeneutic, in which homiletic questions are also dealt with. His catechetical principles Augustine developed in the charming writing De catechizandis rudibus (c. 400). A large number of tractates are devoted to moral and theological problems (Contra mendacium, c. 420 AD; De bono conjugali, 401 AD, etc.). A widespread influence was exercised by the treatise De opere monachorum (c. 400 AD), in which, on the ground of Holy Scripture, manual work was demanded of monks. Of less importance than the remaining works are the numerous exegetical writings, among which the commentary on the Gospel of St. John deserves a special mention. These have a value owing to Augustine's appreciation of the deeper spiritual meaning of scripture, but hardly for their exegetical qualities. His Letters are full of interest owing to the light they throw on many questions in the ecclesiastical history of the time, and owing to his relations with such contemporary theologians as Jerome. They have, however, neither the liveliness nor the varied interest of the letters of Jerome himself. As a preacher Augustine was of great importance. We still possess almost four hundred sermons which may be ascribed to him with certainty. Many others only pass under his celebrated name. The closing years of the great bishop were full of sorrow. The Vandals, who had been gradually enclosing the Roman empire, appeared before the gates of Hippo, and laid siege to it. Augustine was ill with his last illness, and could only pray for his fellow citizens. He passed away during the siege, on the 28th of August 430, at the age of seventy-five, and thus was spared the indignity of seeing the city in the hands of the enemy. The character of Augustine, both as a man and as a theologian, has been briefly indicated in the course of our sketch. None can deny the greatness of Augustine's soul -- his enthusiasm, his unceasing search after truth, his affectionate disposition, his ardor, his self-devotion. And even those who may doubt the soundness of his dogmatic conclusions, cannot but acknowledge the depth of his spiritual convictions, and the logical force and penetration with which he handled the most difficult questions, thus weaving all the elements of his experience and of his profound scriptural knowledge into a great system of Christian thought. Of the four great Fathers of the Church he was admittedly the greatest -- more profound than Ambrose, his spiritual father, more original and systematic than Jerome, his correspondent, and intellectually far more distinguished than Gregory the Great, his pupil on the papal throne. The theological position and influence of Augustine may be said to be unrivalled. No single name has ever exercised such power over the Christian Church, and no one mind ever made so deep an impression upon Christian thought. In him scholastics and mystics, popes and the opponents of the papal supremacy, have seen their champion. He was the fulcrum on which Luther rested the thoughts by which he sought to lift the past of the Church out of the rut; yet the judgment of Catholics still proclaims the ideas of Augustine as the only sound basis of philosophy.